A search has been taking place at a British woman's villa 150 yards from the Algarve apartment that Madeleine McCann went missing from 12 days ago. No-one has been arrested but Portuguese police say they have been questioning three people. 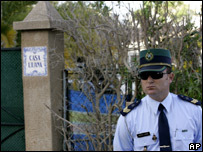 The villa, in Praia da Luz, is used by Robert Murat and his mother Jenny, 71, who said she did not know why it was being searched. Four-year-old Madeleine, from Rothley, Leicestershire, disappeared on 3 May. Chief inspector Olegario Sousa confirmed that more than one person had been taken to make statements at the police station in the town of Portimao, where the investigation is being co-ordinated. He described the search at the villa and the resulting questioning as a "normal development" in the case. BBC correspondent Robert Hall urged caution over the significance or otherwise of the search. He said the villa, known as Casa Liliana, was close to where the media was based and "therefore police have been brought in to tape the area and seal it off". The search began on Monday after Sunday Mirror journalist Lori Campbell spoke to police and the British Embassy about Mr Murat, who has become well known to journalists during the search for Madeleine. Mr Murat, who described himself as half-Portuguese and told journalists he had been helping police with translation work during the investigation, is a frequent visitor to Casa Liliana. He is believed to have moved on his own to Portugal three years ago. He had been living with his wife and family in Hockering, Norfolk. Mrs Murat, a former nurse, has lived in Portugal for 40 years and brought her son and daughter up in the country. When asked by the BBC on Monday why the villa was being searched, she replied: "I don't know why." She then said she was "not allowed" to speak to reporters, before moving away. Mrs Murat, believed to be a widow, has been running a stall on the seafront in Praia da Luz, appealing for information from the public about Madeleine's disappearance. Catherine Roberts, a friend of the family in Portugal, said Mr Murat was often seen having a coffee in the area before he went to work. She added: "Jenny is very well known around here - she has lived here most of her life. Police began searching the villa at 0700 local time on Monday. Officers in white suits with facemasks were seen at the house and in its grounds on Monday evening. It is believed the search has included draining the villa's swimming pool. In the past few days, searches had been scaled back in the area immediately around the apartment where Madeleine was last seen. The focus had shifted instead to an international child abduction inquiry, amid suggestions she may have been taken out of Portugal. Earlier on Monday, Madeleine's parents Kate and Gerry McCann, who is originally from Glasgow, said they would not return to the UK until Madeleine was found safe and well. Mr McCann said the couple would continue to believe she was being cared for until they received "concrete evidence to the contrary". And he said he and his wife had drawn "tremendous strength from the warmth and the spiritual outpouring" the couple had received "here and from all around the world". 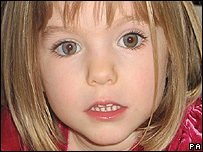 The British ambassador to Portugal, John Buck, said the McCanns were showing "remarkable resilience and dignity". He also said there were "impressive resources" being devoted to the investigation by the Portuguese authorities. The collaboration between the Portuguese and British police was "truly exceptional", Mr Buck added. Rewards totalling £2.5m have been offered to anyone with information leading to the safe return of Madeleine, who was four on Saturday. A "fighting fund" to which members of the public can donate to help in the search for Madeleine is also being set up by her family's lawyers. In the UK, a text message urging mothers to pray for Madeleine's safe return to her family is being passed on by mobile phone and in internet forums. The international number for Crime stoppers is +44 1883 731 336. 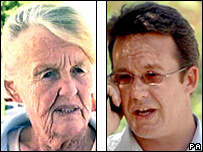 People with information about Madeleine can call anonymously.